I've been keeping tabs on the One Page Dungeon Contest, eager as anyone to see what gets put together. A pretty cool teaser is looking back to a small collection hobbled together from last year's contest. 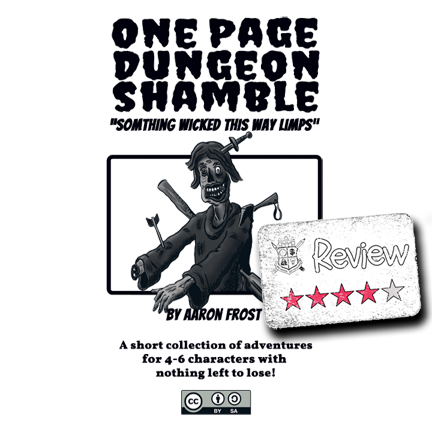 One Page Dungeon Shamble is a collection of five loosely-related adventures. The premise is roughly that all of the PCs have died and come back as altered undead and by working through these five adventures they have a way to come back from their state of undeath. 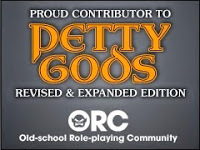 In some ways the PC's new state makes them a bit more powerful than they might have been in life, but there are some measures within the adventures that take some of the bennies of undeath away from the PCs. I liked the general theme of the adventure and if I was planning on using the One Page Dungeon Shamble I know I'd need a lot of tweaking to make it work, and for some game systems it would never work.